Here is a card I came up with tonight, a possible swap for one that's due WAY too soon!!! Somehow those deadlines always creep up on me!! 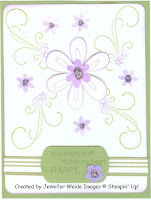 I used the Friendship Blooms set, one that as a customer you can earn FREE during Sale-A-Bration (Feb 1-Mar 17). Base is Wild Wasabi, background is Whisper White. I stamped the flourish image on the Wasabi ink pad, them removed the color from the flowers with a blender pen. Then added Lavender Lace ink with my marker. The center flower was stamped once on the base, then again on an additional layer that I cut out. For the layered flower, I curled the edges slightly over a pen, then attached over the previous image with the huge glue dot for dimension! The new Wild Wasabi Striped Grosgrain ribbon is across the bottom with the Friendship saying stamped on Wasabi and punched with the Key Tag punch. A flower punched with the Three for You punch was added. You might notice the added sparkle, although it doesn't scan well! All the dark purple centers were done with SU! 's NEW glitter! This is the "Orchid" color from the Fine Cosmo Set (p. 186), applied with 2-way glue. LMK what you think. I have to decide if I can create 20+1 of these before the end of the week!